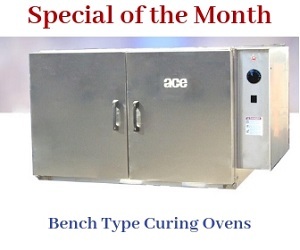 ACE 4112-RT burn off oven is largely opted for heat cleaning products, which are painted electrostatically or powder coated. The oven is widely used in industries such as automotive, parts rebuilding industries, etc. The oven is offered with the optional One Touch Control (OTC) system that assists in monitoring the combustible vapors in the oven. The normal burn off time of this model is between 2 and 8 hours along with a combustible capacity of 40 LBS/HR. It varies with the combustible load and oven size. This radiant tube oven model is widely chosen for its beneficial aspects that include cycle time control, fire prevention systems, burner control stack construction, afterburner design, and pressure relief door design. The following tables provide further details about the oven including the technical specifications. Volume Over Cart 102 CU. FT. The oven and its control are NFPA (optional), U.L, FM (optional) and ISO certified. This gives the assurance of safe and reliable operation.